The Doctor rescues Clara from space using the TARDIS but after they land on earth, they're taken captive by Vikings. The Doctor tries to defend himself with his sonic sunglasses but a Viking just breaks them instead. When The Doctor pretends to be Odin, they dismiss his attempts to tricks them. An image of Odin appears in the sky and invites them to Valhalla, after which some armoured suits come and seemingly disintegrate the Vikings. The Doctor however, determines that the suits are using advanced technology to teleport the warriors away. Clara tells a young girl named Ashildr to use the sonic sunglasses to get them free but they end up struck instead by the weapons. The suits disappear and the Doctor is left alone with the remaining citizens of the village. Clara, Ashildr, and the other Vikings are on a spaceship where the male Vikings are dying by being drained of their adrenaline and testosterone. Clara and Ashildr escape and meet "Odin" who is the leader of the Mire, a hostile alien species that prides itself on its fearsome reputation. Clara wants to negotiate peace, but Ashildr declares war for her people. "Odin" will attack in 24 hours and returns the women to the planet where Clara tells the Doctor about all that transpired. The Doctor tries to get the villagers to abandon the village until the Mire have left but they want to stay and fight, though they have no skills or experience in combat. The Doctor tries to train them but it doesn't make much of a difference. Using Ashildr's homemade puppets, the Doctor learns about electric eels the fisherman have caught and uses this knowledge to form a plan. The Mire arrive at the village to attack only to find that the villagers are throwing a party. Confused, they hesitate to attack and this distraction allows the villagers to use the electricity from the eels to overload the suits and remove one of the helmets. The Doctor modifies it and gives it Ashildr who uses the images from her stories which causes the Mire to envision a dragon attacking. The Mire run off and the Doctor threatens to broadcast a recording of this cowardly display if "Odin" doesn't leave. He fears this loss of reputation so he leaves on the Mire ship with all his shulders. The villagers rejoice in their victory but the Doctor finds that Ashildr has died from heart failure due to the stress of using the helmet. The Doctor then remembers how he chose the face he currently has to resemble Caecilius whom he had saved in Pompeii. He is inspired to once again break the rules so that he may save Ashildr. 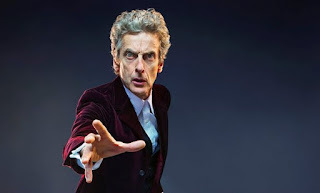 Using a modified computer chip from the helmet, he implants it in Ashildr and gives her father a second chip for her to use later. The chip regenerates her and she is brought back to life. But the Doctor tells Clara that he may not have done the right thing, since the chip will never stop working so Ashildr is now immortal. The second chip is for Ashildr to give to someone else once she finds someone she can't live without. We then watch as Ashildr watches the world age and her expression shifts from awe, to grief, to rage.